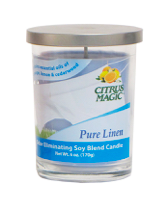 Citrus Magic is happy to present our newest line of odor neutralizers, Citrus Magic Odor Eliminating Soy Blend Candles. Each candle uses naturally-derived fragrances made with renewable essential oils. The 6 oz. candles come in some of our most popular odor-eliminating fragrances. Choose from Pure Linen, Lavender Escape, or Fresh Citrus. The Citrus Magic Odor Eliminating Candles are not your mother's candles. Each candle sits in a sturdy, yet appealing glass container that is complete with a metal lid. It is as attractive as it is effective.